Pet Poison Prevention Week continues, and today’s focus is grapes, raisins, and currants, which can cause kidney failure and even death in dogs. That includes oatmeal raisin cookies, cinnamon raisin bagels, trail mix, raisin bran…lots of human foods that an undiscerning dog may gobble up are potential toxins. Poisoning has occurred in dogs following ingestion of seedless or seeded grape varieties, commercial or homegrown fruits, red or green grapes/raisins, organic or non-organic fruits, and grape pressings from wineries. (While not established as a cat toxin, there have been anecdotal reports of cats and ferrets being affected too, so keep grape, raisin and currant treats away from all of your four-legged friends). Unfortunately, there is no well-established toxic dose for any of these fruits but two principles seem to prevail: 1) Dogs are more likely to become poisoned if they ingest large amounts of fruit and 2) there is significant individual sensitivity amongst dogs. 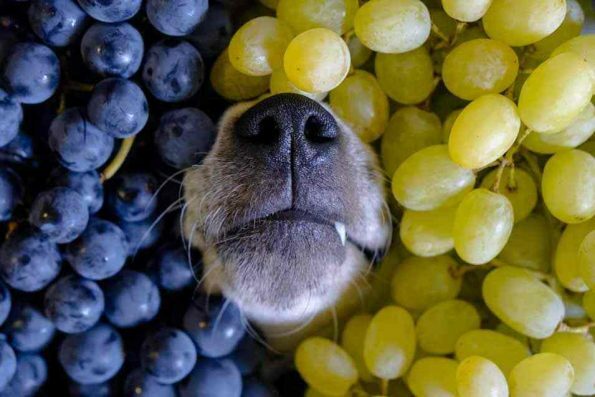 Some dogs appear to tolerate small doses of the fruit without consequence while other dogs may develop poisoning after the ingestion of just a few grapes or raisins. There is no way to predict which dogs may be more sensitive. Raisins are more concentrated than grapes, so are believed to be more dangerous. Currently, it is not known why these fruits are toxic. Some researchers suspect that a mycotoxin (a toxic substance produced by a fungus or mold) may be the cause. Some suspect a salicylate (aspirin-like) drug may be naturally found in the grape, resulting in decreased blood flow to the kidneys. However, so far no toxic agent has been identified. Since it is currently unknown why these fruits are toxic, any exposure should be a cause for concern. The most common early symptom of grape or raisin toxicity is vomiting, which is generally seen within 24 hours following ingestion. Lack of appetite, lethargy, and possibly diarrhea can be also seen within the next 12-24 hours. More severe signs are not seen for 24-48 hours after ingestion – often after acute kidney failure has already begun. Signs of acute kidney failure include nausea, lack of appetite, vomiting, uremic breath, diarrhea, abdominal pain, excessive thirst, and excessive urination. If you suspect that your pet has eaten any of these fruits, please contact your veterinarian (or your closest 24-hour emergency clinic) immediately. Do not waste any time; since there are still many unknowns associated with this poisoning, it is better not to take chances. As with any toxin, the sooner the poisoning is diagnosed and treated, the less dangerous for your pet, and the less expensive therapy will be for you. Your veterinarian will take immediate action to block absorption of the toxins (by inducing vomiting and administering activated charcoal) and to prevent or minimize damage to the kidneys (by aggressively administering intravenous fluids to flush any absorbed toxins out of the body and using medications to help maintain kidney function). They will also recommend diagnostic blood tests to assess the amount of damage to the kidneys, which will help determine the dog’s likelihood of recovery. Prognosis depends on many factors, including how severe the poisoning was, whether treatment was initiated soon enough to block absorption of any of the toxins, whether or not they have already developed kidney failure, and whether the clinical signs and kidney values improved once treatment was started. If a dog only ate a few grapes or raisins (depending on the size of the patient) and received immediate treatment, their prognosis is excellent. However, if their kidneys are damaged and no urine is being produced, their prognosis is poor and fatality is likely. Prevention is the best medicine! Always keep grapes, raisins, currants, and treats containing these fruits securely locked away from your pets!